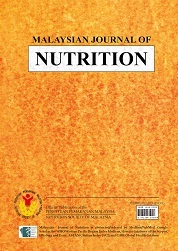 Welcome to the Malaysian Journal of Nutrition! MJN is ranked high in the Malaysian Citation Index (MyCite) of the Ministry of Education. The journal has also become one of the most preferred English language nutrition journals in the region. MJN is abstracted/indexed by Medline/Pubmed, Google Scholar, the WHO Western Pacific Region Index Medicus (WPRIM), Elsevier databases of the Scopus, EBiology and ECare, ASEAN Citation Index (ACI) and CABI Global Health database. The journal continues to strive to improve its quality and services to nutrition scientists in the region. As one of efforts towards this end, MJN has adopted an on-line system to process and review manuscripts from February 2018.